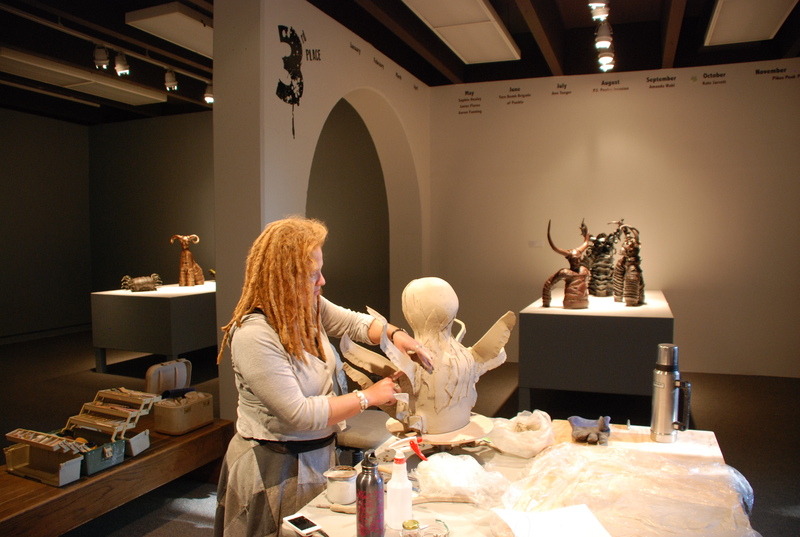 Another aspect to having a show in the Hoag studio is the opportunity to work in the space. This was both fun and challenging. I worked in the gallery during its open hours, except fridays and saturdays which are taken up with teaching. The studio was well put together, consisting of a super sturdy salvaged table, the small slab roller from my permanent studio and lots of clay and tools. October was the shortest month in the cycle so far (from first Friday to last Monday) so my time for producing work was limited but I was diligent in being there and using my time so I actually produced quite a bit. Originally I thought I would make a new pair of monsters to display at the second opening on the third Friday of the month, but I chose instead to work on Tengus, the crow demons that are the other consistent body of work I am involved with now. This choice had two purposes, first, I wanted to let the monsters rest a bit and take the opportunity to listen to the work and to what people said about it. Seeing it installed, in sequence both with the story and the time of making was a wonderful chance to review the work of the past year and take stock, consider more deeply the direction I would like the work to take in the future. Next I wanted to play a bit with suggestions from my school critique, seeing if I could make sense of ideas I felt were compelling.This is difficult to do with the monsters them selves as the rules for their world are in some ways set. Its not that rules cant be changed but I need a good reason to do so and also a solid direction, neither of which I felt I had. The first piece I made was not a success. 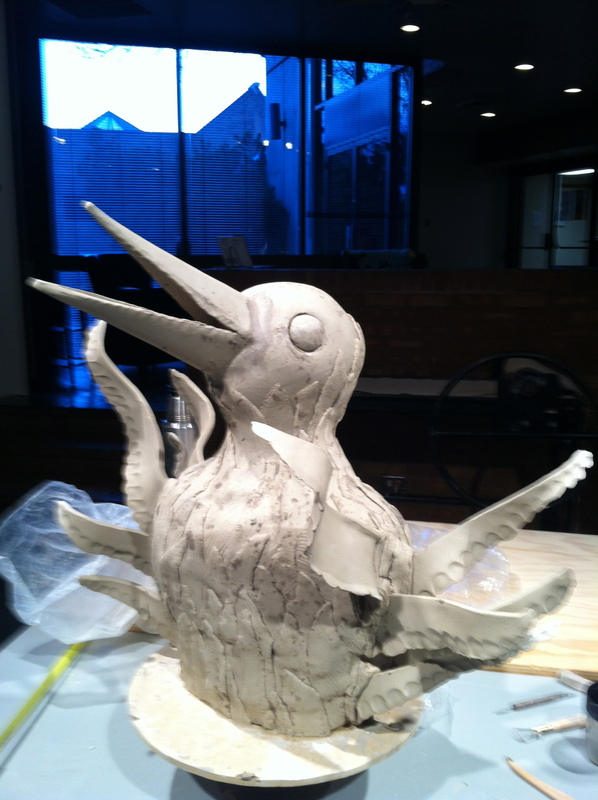 From build to paint surface the bird is forced and stilted, Primarily I think from the pressure of making work for an audience. Concentrated stretches of time were few and conversations were many, while this works while I am teaching, I found it much harder to produce my own work under these conditions. That being said, the Tengu (the largest and most complex of the series) led me to the series I made for the Own Your Own show that opens Friday. Informed by the problems I felt the large piece had, I made a series of much lighter and smaller birds for that show that turned out very well. Those were also produced primarily in the Hoag Studio. Here he is before paint.